Melka is a non-hostile hagraven that is found locked up in a cage inside Blind Cliff Bastion. She will ask you to release her so she can get revenge on the other hagraven, Petra, who locked her up there and stole her tower from her. After talking to her, the miscellaneous quest The Affairs of Hagravens will be started. If you decide to release her, you will have to guide her through the tower; she will tell you how to avoid and turn off traps, and seems eager for you to like her tower. If she is still alive when Petra is killed, she will give you her prized staff, Eye of Melka. She will then stay in the area Petra was killed in. Alternatively, you can choose to kill her instead to obtain the staff. Like other hagravens, Melka knows Fast Healing and Close Wounds. However, while other hagravens use spells which cause fire damage, Melka uses the spells Frostbite, Ice Spike, and Ice Storm. The Affairs of Hagravens: After discovering an imprisoned hagraven, you must help her reclaim her lost tower. She mentions that she likes to mix "pretty poisons" and collect eyeballs. She will refer to you as "meat", "morsel", and "nibble", suggesting that she eats humanoids. She will call you "Breton" even if you are not. If you say that you are not a Breton, Melka will reply that all people look similar for her. 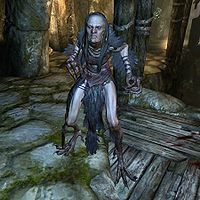 If you are playing as an Argonian or Khajiit, she will mistake you for an Orc. You can then say, "You... must not see many Orcs around here," to which she remarks that all Orcs look the same to her. Melka is the "sister" of Petra. You discover this after Petra is killed when she says "I spit on you, dead sister." However, it is unclear whether this relationship is determined by blood or due to the fact that they shared a coven. This page was last modified on 14 January 2015, at 02:48.